A bit of group history – Sunnerbogillet was established in 1959 and is still, after 52 years, an active group with a wide range of commitments. Our first priority is to study and carry on Swedish folklore, e.g. folk dance and music, costumes, handicraft and traditions. Very early international folk dances were included in the repertoire in addition to exchange visits with folk dance groups in many other countries. 1968-1998 Sunnerbogillet had many children’s groups. 1973-1997 public entertainment and dance programmes were arranged 10 evenings every summer. 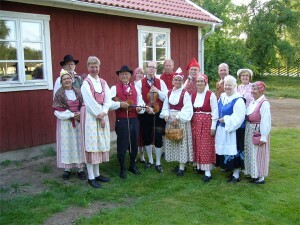 Main activities – Dance practices with Swedish and European traditional folk dances once a week during September-December and February-June to the music of 3-4 violins and one key fiddle, performances, public engagements and workshops. Our costume – Our costumes are copies of the peasants’ festive costumes from early 1800, mostly representing the homestead of the members. Membership – Starting with about 30 members 1959 Sunnerbogillet had its peak in 1975 with 273 members, primarily children and young people. Now we are back to around 35 adult members. The Swedish National Day 6th June, mid summer festivities, local festivities, Nordlek; the Nordic Folk Dance and Music Festival.